Changing desert areas for land use implies a lot of ecological problems. These and related ones are dealt with in this book covering various interdisciplinary and international aspects. Large areas in arid and semi-arid regions are already polluted in various ways. One of the biggest problems is the anthropogenic salinization by inadequate means of agriculture and irrigation. Additionally, most arid areas in the world are dramatically overgrazed. Methods and practices of a sustainable land use in deserts are urgently needed in many arid regions. This book gives a broad survey on some of the affected regions of the world as well as some case studies from elsewhere (Aral Sea, Negev desert, Namib desert etc.). Thus, basic and applied sciences are brought together. 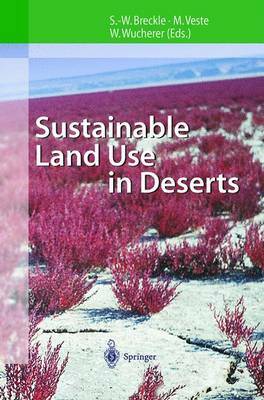 Water management in deserts, grazing systems or reclamation of desertified areas are among the topics of this book, as well as social and economic aspects.